The premise is unique , a sort of hero you never hear about . A blind and autism stricken child of 12 that has prolific visions of the true nature of all he encounters .Usually comic heroes are reactionary at best , in others they come to the rescue after the fact .However what if they saw the true nature of good and bad and how would they react . The story follows the birth and life of Daniel Prophet , a blind, autistic savant 12 year old that performs a piano recital for the President of the United States and is subjected to visions of the good and bad people all around him with a chance to see the present and the future. In all honestly this book really shook me up. The story would be a great movie and with all the monsters and demons in movies nothing is more scarier then real life and this book is scary because is could happen. We could elect officials that want to suspend the constitution . Texas and other states could possibly succeed from the union and America and the world could face a dystopian future . 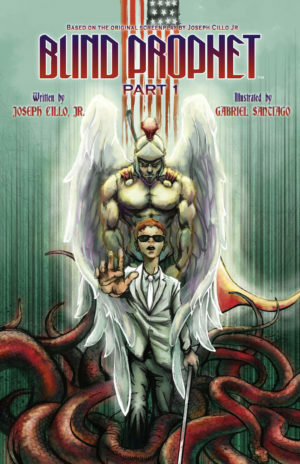 The book is the creation of author Joseph Cillo Jr. and is illustrated by Gabriel Santiago. I consider this an adult read and advise at least 14 years and above to truly understand the implications of the story .This is just part one and I am looking forward to continuation of the story .